Former L.A. Times publisher and CEO chatted with dean Steve Coll. For FishbowlNY, the overwhelming takeaway is Beutner’s intelligence and clarity of vision. Folks in Southern California will likely feel more deeply betrayed by Tribune Publishing once they watch this conversation. Among the audience members asking questions were New York Times media reporter Ravi Somaiya and Politico Media’s Joe Pompeo. 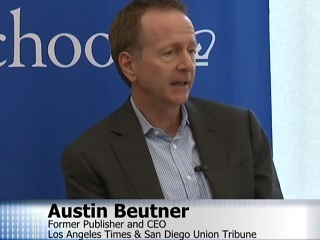 Unfortunately, the audience Q&A was the only portion during which Beutner disappointed, deflecting perhaps a bit too diplomatically when asked about things like the challenges of growth within a publicly held corporate environment and the impact of those looming L.A. Times newsroom cuts. Beutner at one point explained that he used to receive the Washington Post’s Sunday print edition, but said his subscription to Mike Allen’s daily Playbook email rendered that product unnecessary. The former publisher also dropped a statistic that is both astounding and a solid basis for the civic engagement initiatives Beutner pursued while at the paper: almost 90 percent of L.A. Times subscribers voted in 2012.